I've been scrambling to get all the Easter cards done that I needed and I mailed the majority of them earlier this week. 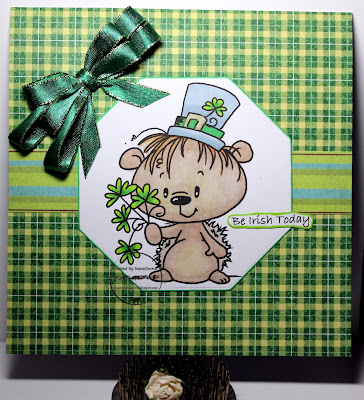 This is the first one I made but it's the last to be posted since I was holding it to post for my DT card for today's new challenge at QKR Stampede. 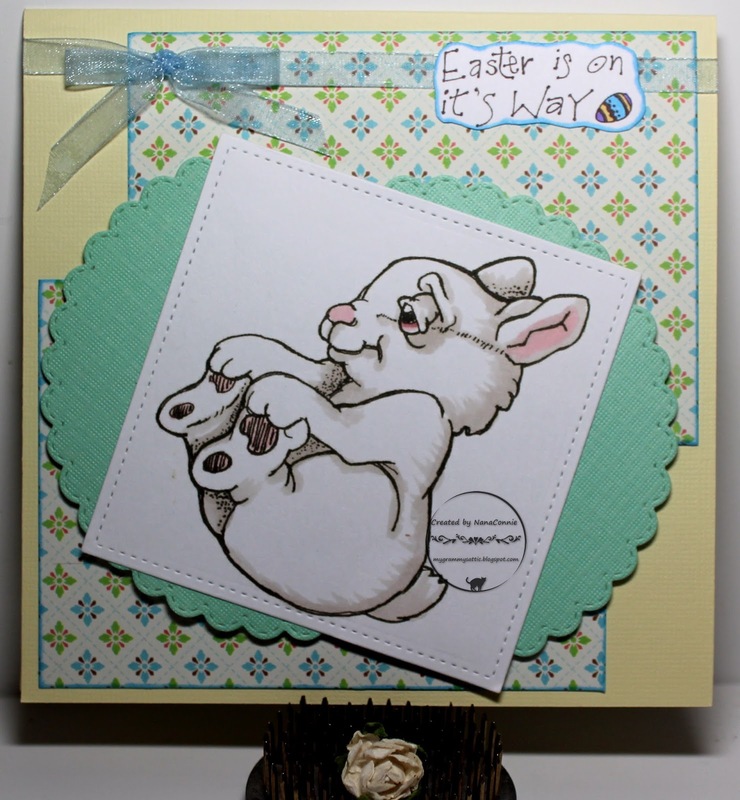 I used an image called "Being Silly" and a sentiment called "Easter Is...". I think it's adorable! 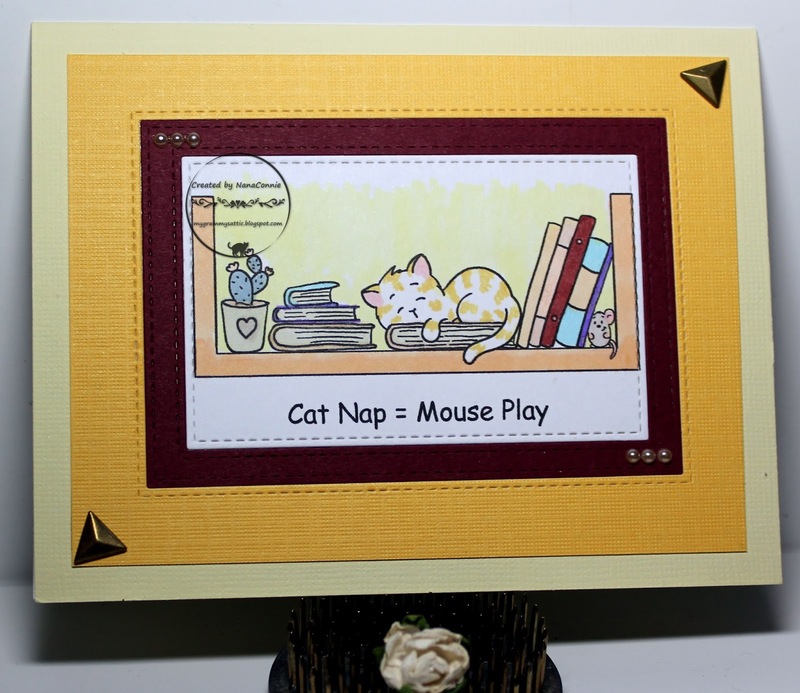 I colored it with ProMarkers and die cut it with a stitched die from Lawn Fawn. The two scalloped circles were cut from sea foam green CS with a Memory Box die. The dp came from a stack by DCWV. 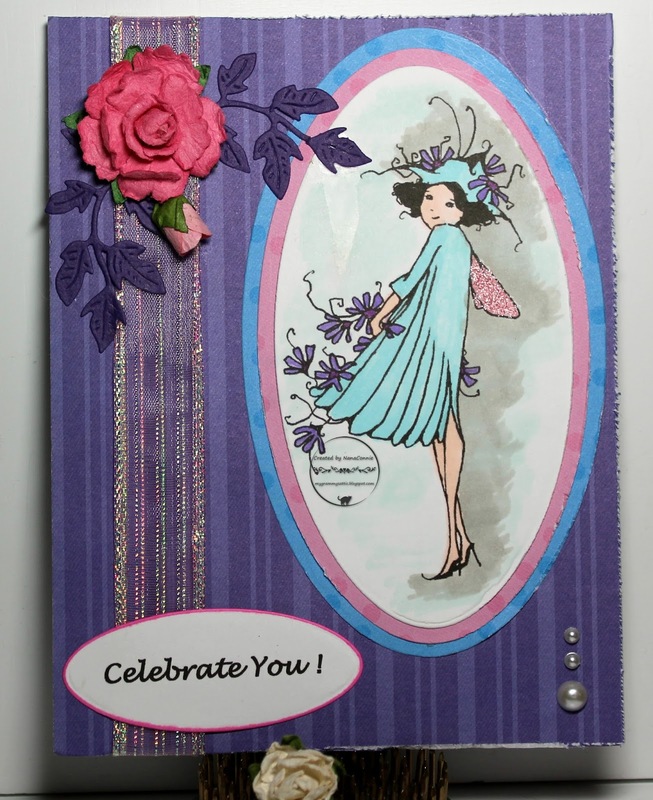 I found some sheer ribbon in my stash and wrapped it around the card front, then tied the ends into a bow. 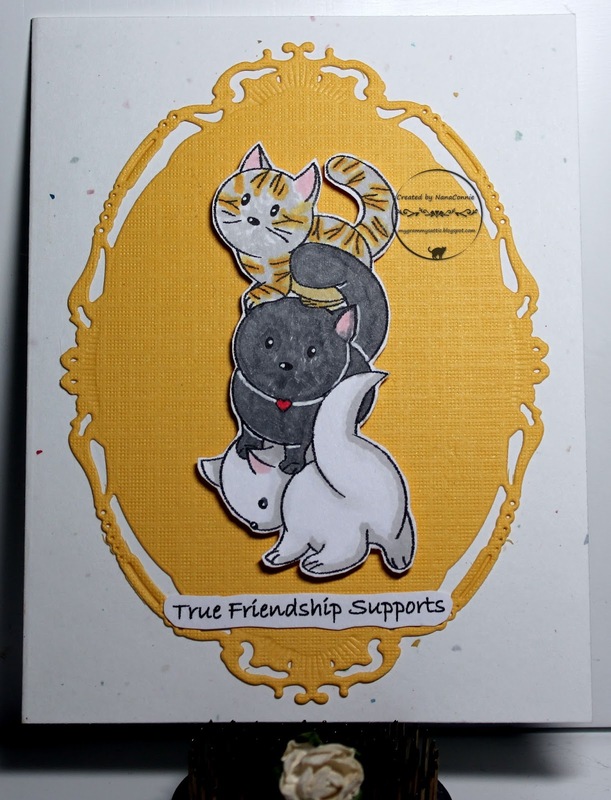 I printed the sentiment, fussy cut it, inked the edge, and layered it on top of the ribbon. 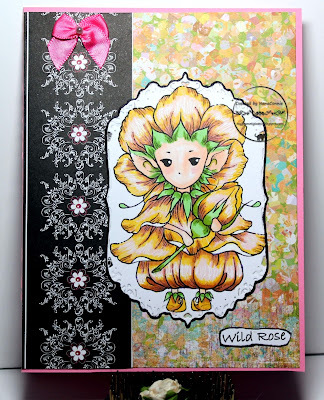 This morning, I have another version of wild roses, this time with an image from SheepSki Designs. I'm starting on Mother's Day cards because this year I have a commission to do a full dozen for a quilter's group. I used ProMarkers to color the image, then cut it with an oval die from Cheapo Dies. 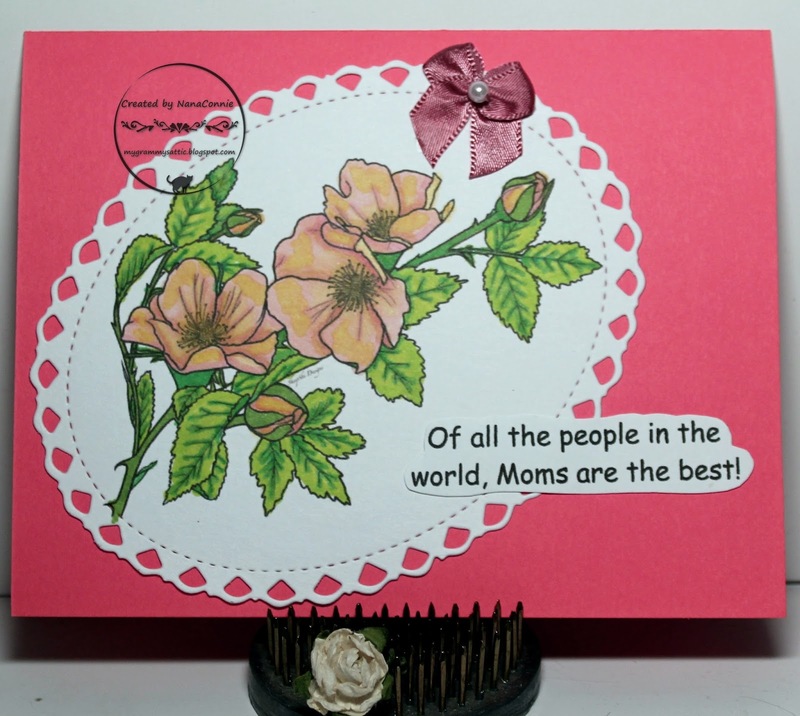 I added the image to a pink card front before printing, hand cutting, and adding the sentiment. I wanted a CAS design so I added only the one, tiny bow which had been "dyed" with a ProMarker. I'm so excited about today's card. 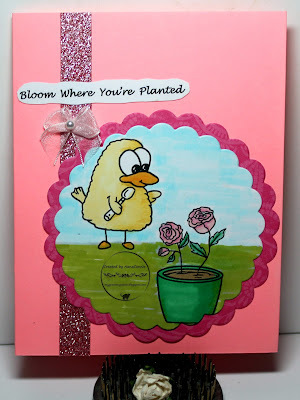 I made it because I was invited to be a Guest Designer at Pixie's Crafty Workshop, better known as "The Playground." Each challenge runs for two weeks and we're already one week into the current challenge so this card serves as the half-way reminder. Themes are always Anything Goes but there is a requirement that you use 'snippets' - you know, those bits and pieces of scrap that we feel so good about using up instead of tossing them into the trash. 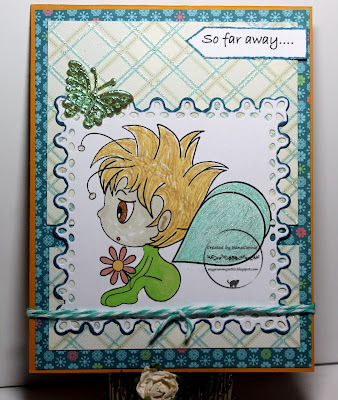 The image is from Bugaboo Stamps, printed onto a scrap of white CS, and colored with ProMarkers and polychromos pencils. I used a Sue Wilson die to cut it. 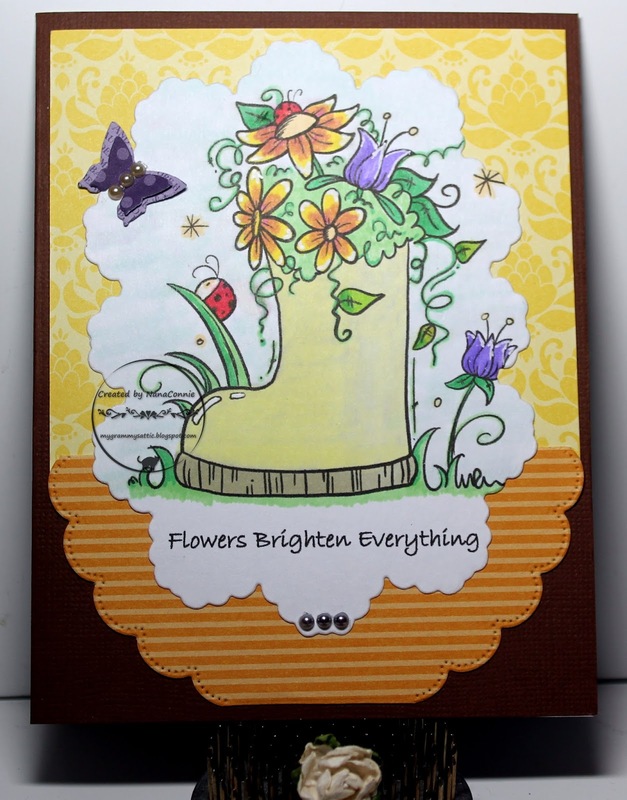 The yellow dp on the upper part of the card is another scrap and I trimmed it to fit the width of the card. I cut the double butterfly with another die, this one from Presscut, and the paper was double sided so I got two layers for the butterfly even though the paper was nothing more than a very tiny scrap. I layered them together and added three tiny pearls which were left over from another project. 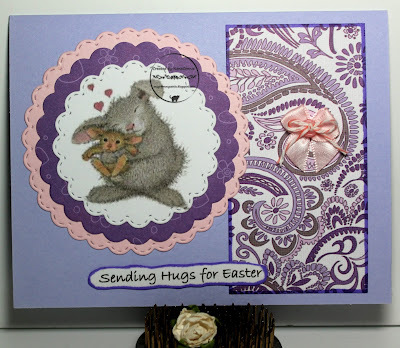 Two Easter cards within a few hours of each other! Well, I did warn you last weekend that I was behind on getting Easter cards finished so I've been playing catch up. This one I did as my DT card for the QKR Stampede "Anything Goes" challenge which starts this morning. On this card, I combined two different images from one of our sister companies, Eureka Stamps; "Bunch of Bunnies" and "Bunch of Eggs." Remember, even though I give you links to the digi stamps, nearly all the QKR and Eureka stamps come in rubber as well. These two do. I kept this one as CAS as I could. 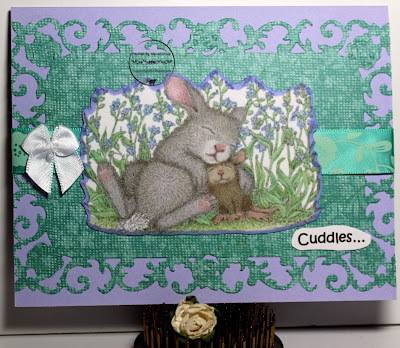 I colored using ProMarkers, then cut the Bunch of Bunnies with an oval die from Spellbinders, and embossed around the edge. I fussy cut the Bunch of Eggs, then arranged the images one above the other so that the bunnies were looking down at the eggs. I printed and hand-cut the sentiment and put it below the images. I found one of my Fiskars corner punches and used it on the lower corners. 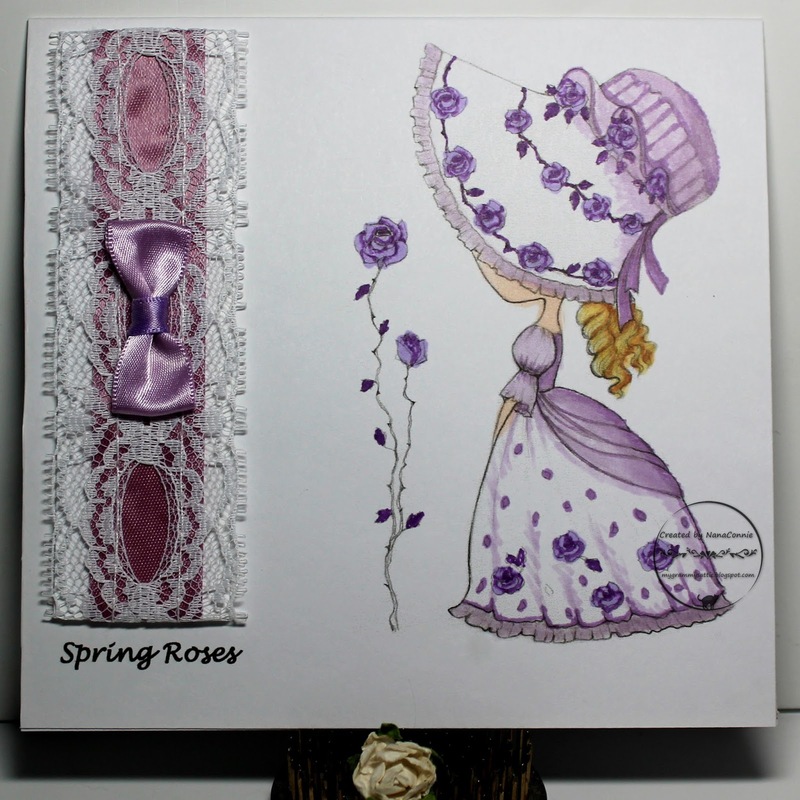 Finally, I found sheer, burgundy ribbon to wrap and tie around the top of the card. I'm sure every child believes that an Easter celebration must be filled with hopping bunnies so I'm doing my best to give them that. because I just couldn't get it to work. I used the purple crocuses instead. 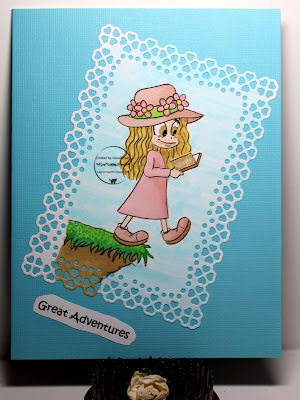 That darling image is from Bugaboo Stamps and I colored it with my polychromos pencils and ProMarkers. 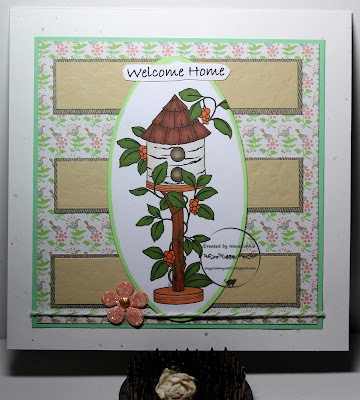 I cut the image with a die from Sue Wilson and then cut the backing for it with another die from that same set. I had already decided that I wanted to do a monochromatic theme so I chose my favorite color, purple. The background CS is hand bleached with a Q-tip, a long process but I take an entire weekend to do several sheets of different colors all at once and then keep them for future use. 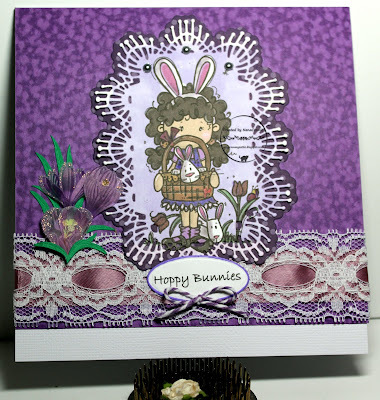 I added lilac ribbon to the white lace and wrapped it around the card front before adding the image and sentiment. I tied a tiny bow using purple baker's twine and then added the flower embellies, plus pearl gems at the top of the image. The flowers are sparkly with glitter for a tiny bit more bling. I found a different challenge the other day and made this card from their inspiration 'wheel.' 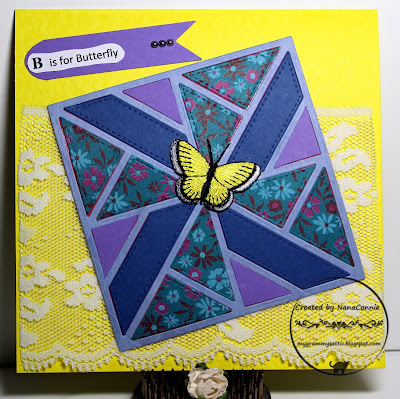 It's Called Butterfly Challenge and each time they choose as letter from the alphabet and give three color options and three theme options, and you can choose any one color and one theme to combine plus you must use a butterfly. I did this card using all the colors and themes: lavender, lemon, & light blue plus lace, layers & letters. What do you think? The quilt die is from Gina Marie and I used it to cut scrap paper from my stash plus light/medium blue and lavender CS. 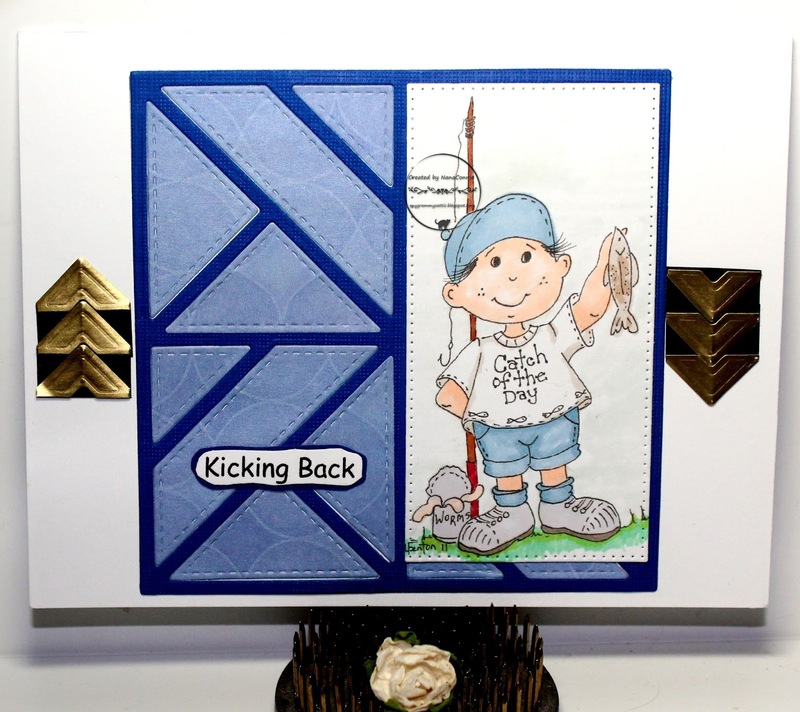 I used the light blue as the 'frame' then inset the blue and lavender CS pieces. I filled the remaining spots with the flowery dp. I layered white lace onto lemon yellow CS, then added the quilt piece on top. I printed the sentiment and hand cut it, layering it onto a banner flag. The final touch was the embroidered butterfly, done in lemon yellow. It was quite a challenge getting all 7 items but it felt good when I finished and I really love the result. 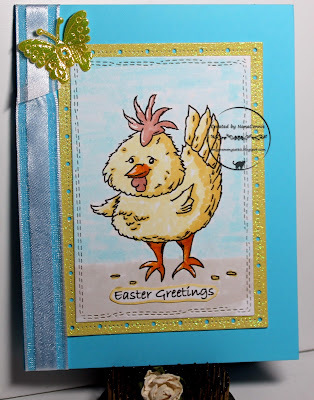 This darling little chick from Limited Runs is the image for their Progressive Challenge on FB. 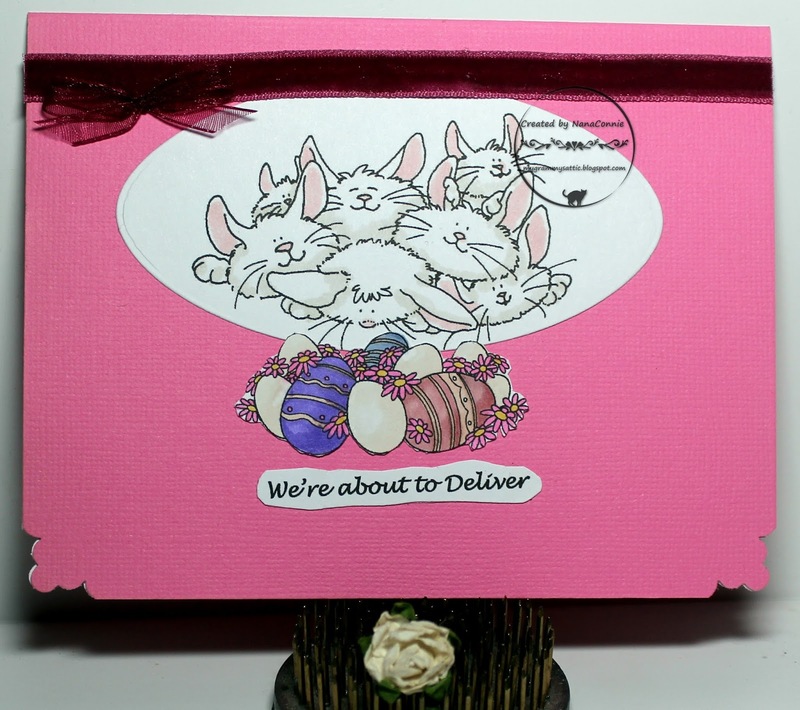 Although it isn't necessarily intended to be an Easter image, I thought it would make a really cute Easter card. I colored with my ProMarkers, and use a stitched die from CUTplorations. I matted that by cutting some glittered CS (with great texture!) with a die from Gina Marie. That piece went onto a turquoise card base, then I added white ribbon and the shiny butterfly, die cut (Cottage Cutz) from stiff taffeta fabric. It's 3D and adds more great texture. Rather CAS but easily mailed without bulk or extra postage. I have the most exciting announcement - I was selected to join the DT at World Wide DT Open !! As I type up this blog post, it dawns on me that I need to calculate the time difference between California, in the USA and Sydney, in AU. 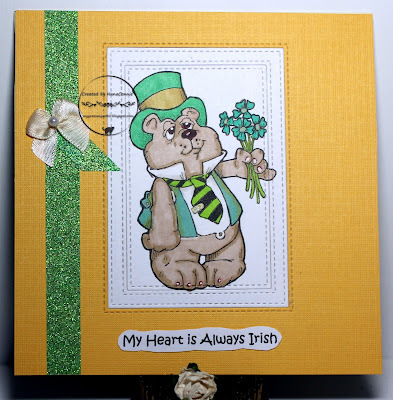 My apologies to my teamies for being so late getting this post up and live. I'll be on time next month, I promise. Our theme is always "Anything Goes" but you must be a member of a Design Team somewhere or a member of the Julia Spiri FB group in order to enter. We are sponsored by Julia Spiri and that means we get to use the fabulous images she supplies to us. Anyone cans be a winner but if you also use one of her images, you qualify to be one of our "Spotlight Winners." I started by using "The Victorian Hat." I printed the image and the sentiment directly onto the card front since I knew I wanted a fairly CAS card design. 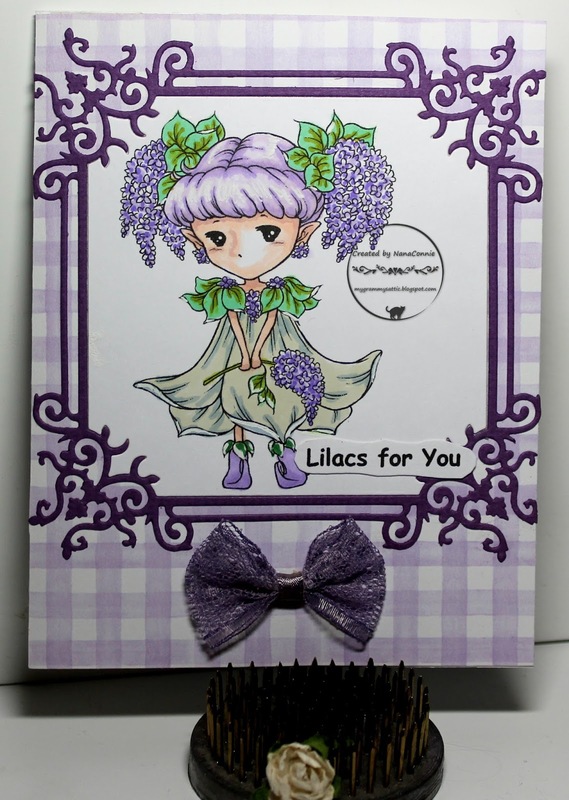 I used my favorite purple and lavender ProMarkers to color this image, adding skin tones and hair color ProMarkers as well. 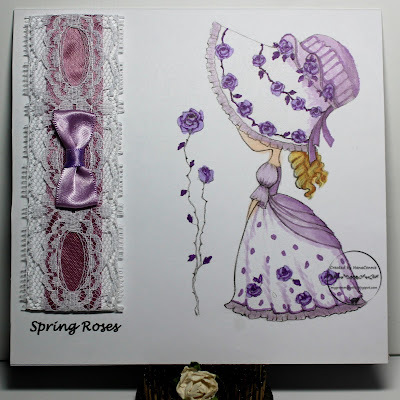 For a touch of vintage, I found some lovely lace, added a violet ribbon behind it, and wrapped it around a bit of CS before adding it to the card front. I tied one of my bow-tie bows, using lavender satin ribbon. For all my good intentions of working on things for an upcoming yard sale, I got hit with a flu bug and have spent most of the last 48 hours either in bed or hugging the porcelain throne! 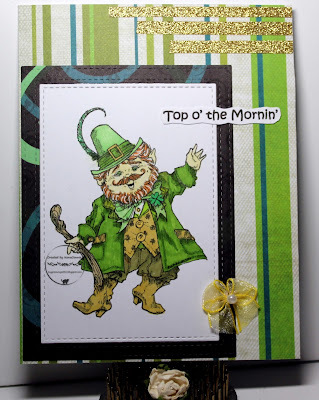 However, I had this card made and thought I had pre-scheduled the post but when I dragged myself out of bed to link it up to the various challenges, I discovered I hadn't even written the post. Arrrg! 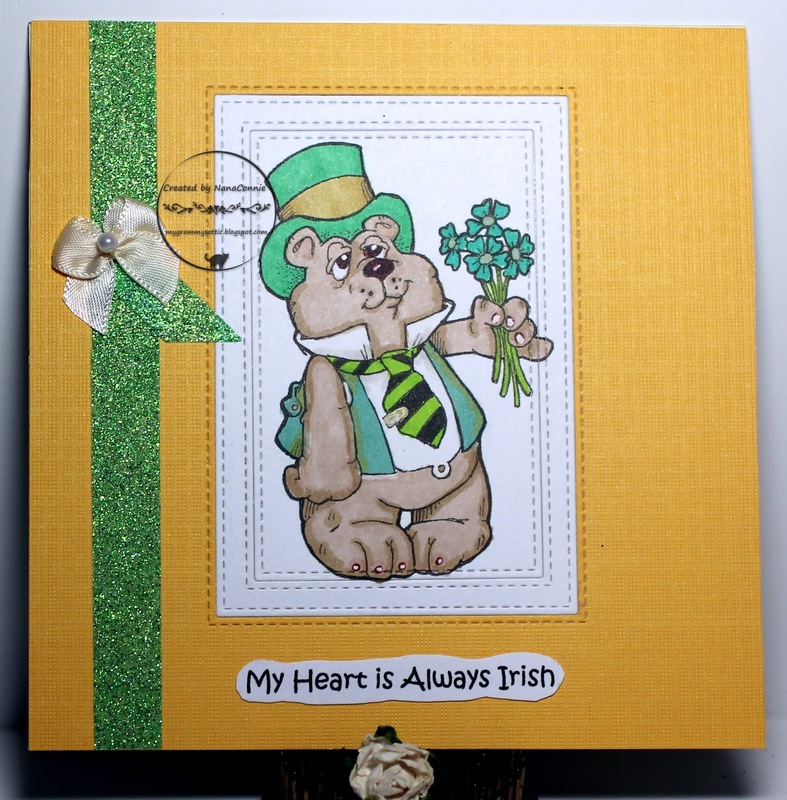 The image is from Rick St. Dennis and is one of most most delightful of my "leprechaun" images. I know I haven't used it before even though I've had it a while. then flipped it side to side. I colored him with my ProMarkers, then cut him with a stitched die from Die-namics. I cut the frame with another die in that same set, using a scrap of dp from the leftovers basket. 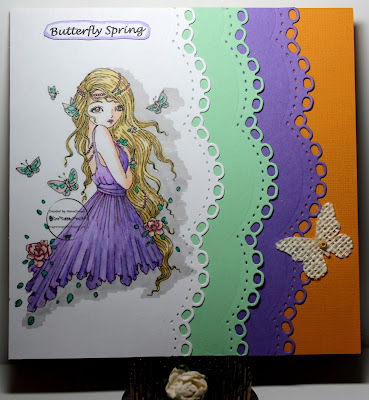 The striped background paper was also a scrap. I used glittered washi tape to make the gold stripes and added on of my hand-sewn bows with a tiny pearl. Finally, I printed the sentiment, hand-cut it, and layered it onto the image piece so that it went out-of-the-box. Yesterday we got up to 73F and I thought for sure spring was actually here. Then, by bedtime, thick clouds rolled in and we're sure to have a storm tonight or tomorrow. Oh, well, maybe it'll be a spring shower. :-D In either case, I know that when the ladybugs arrive, spring is here for sure. I decided to use colors from the challenge at The Outlawz. This adorable image is from Bugaboo Stamps and I colored it with ProMarkers. 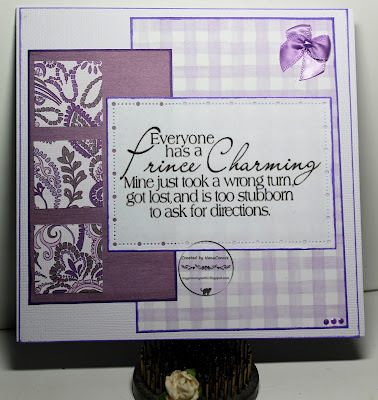 I cut the image and all three dp pieces with dies from Lawn Fawn (Large Stitched Squares.) The 3 dp pieces (DCWV) were in my scrap basket and I cut each of the scraps as large as I could, wasting as little as possible. The stitching part got a bit lost in the pattern of the dp so I highlighted the stitches with sparkly, white gel ink, although in the photo it looks mostly white. The sparkle just didn't photograph. I played a bit with how to arrange all the pieces but settled on what you see here. I printed and hand cut the sentiment, then tied a tiny bow and 'dyed' it pink with a marker. I added one sequin and a teensy drop of Liquid Pearls for a little touch of bling. 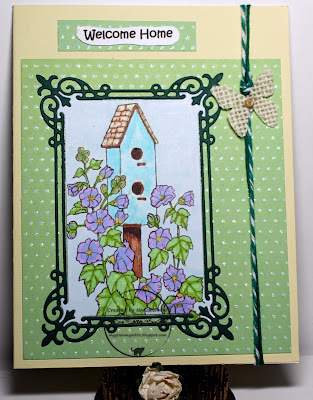 I'm really into birdhouses this week but I'm still trying to convince Mother Nature that it's time for Spring. :-D We start a new challenge today at QKR Stampede and our theme is always Anything Goes. This sweet little image came from QKR and is called "Birdhouse and Vines." I colored the image with ProMarkers and polychromos pencils, then cut it with a Bo Bunny die. The dark green frame is also a Bo Bunny cut. 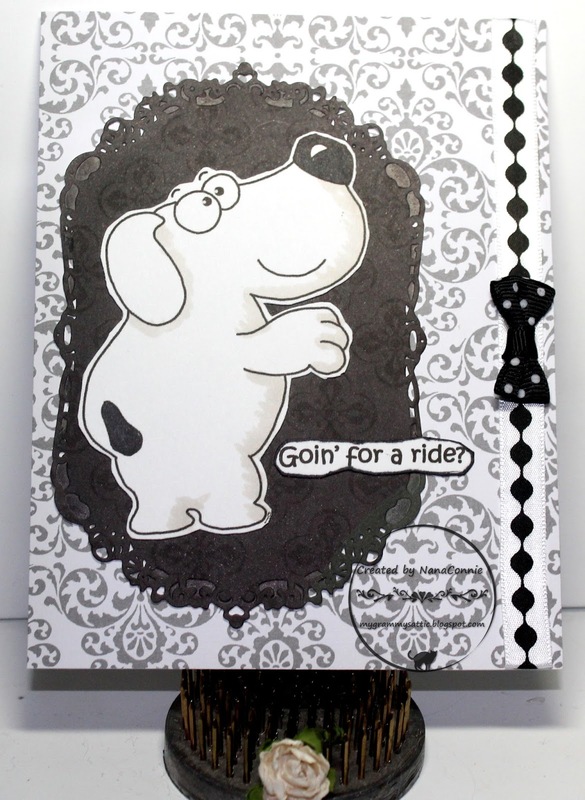 The background paper is embossed with a Swiss Dots folder but I had added embossing ink to the dot side before I ran the folder through the Cuttlebug. When it came out, I sprinkled it with glittery EP and heat embossed it. It had to be trimmed to the size I wanted and I mounted the image pieces onto it. This is a new technique for me and I'm going to be doing more of it. I printed the sentiment and mounted it onto a scrap of the embossed paper. 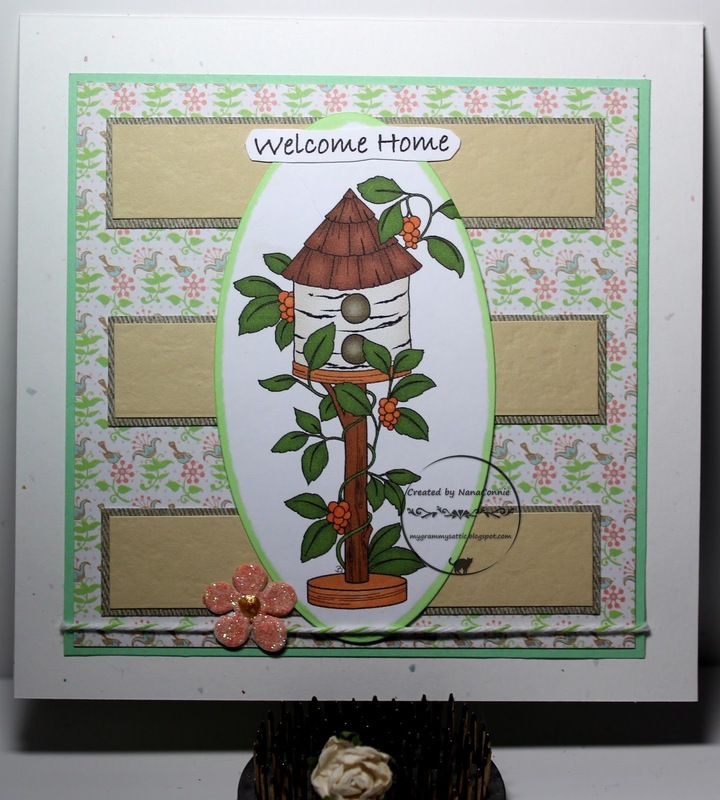 Finally, I added bakers' twine and the die cut, burlap, butterfly. I had so much fun with this card ! I started with a pre-colored image from Beccy's Place which best matched the optional colors from their challenge this month. 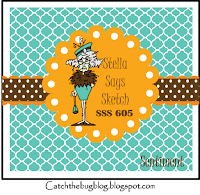 I also used a sketch which I found at Sweet Sketch Wednesday 2. 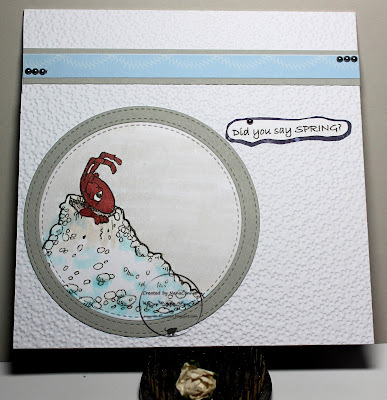 I used an oval die from QuicKutz to cut the image, then inked the edges with a ProMarker. The patterned background paper is from one of my DCWV stacks, but since it was a scrap, I have no idea which one. I matted it with pistachio green paper. The three strips were cut from textured 'leather' CS and backed with stone-washed denim. All of those were also scraps. I added baker's twine and a die cut flower. I colored the flower with ProMarkers, then added glitter for a bit of sparkle. The center is a peach colored, Liquid Pearls drop. I printed and hand cut the sentiment. While everyone else in the world was counting crocus buds as the first sign of spring, my dad always said that spring had arrived when you could grab a pole and sneak away for an afternoon of lazy fishing without freezing from sitting still. :-D Here's a salute to spring and my dad. 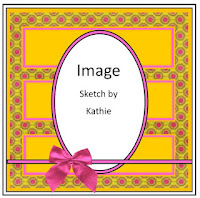 The image is from Anne Fenton at Anne's Digital Art and is the freebie this month for the Progressive Challenge at The Outlawz. 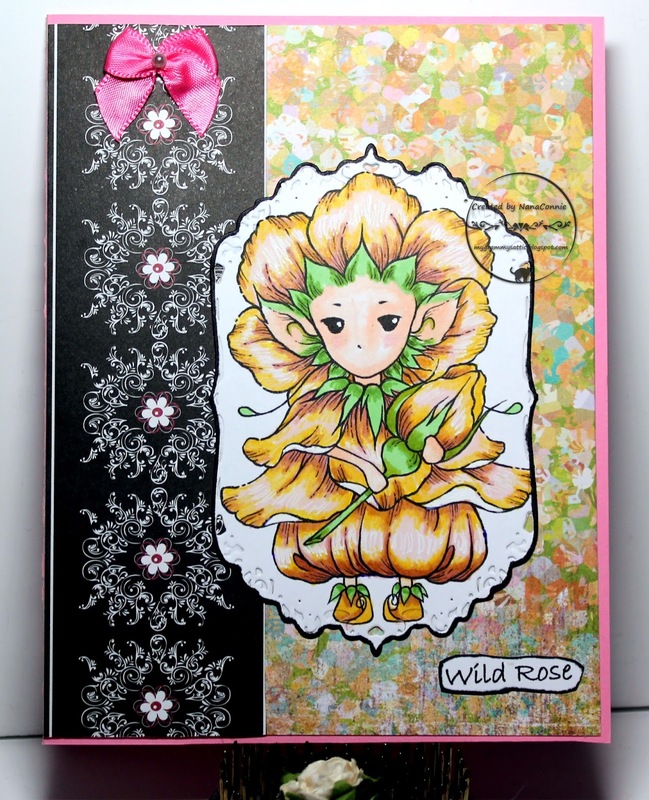 I colored with ProMarkers and cut the image with a pinpoint die from Memory Box. While the die is a rectangle, it wasn't narrow enough for what I wanted so I cut twice, moving the die to narrow the original cut. The "quilting" is cut with a Gina Marie die, cutting two different papers and inlaying them to get the quilt look. I printed the sentiment, matted it, and added it across the quilting. Cats nap about 19 hours out of every 24. Remember that old saying "When the cat's away, the mice will play" ?? Well, what about when cats nap? Do the mice get to play then, too? I used ProMarkers to color the image, and then cut it with a stitched, rectangle die from Die-namics. I cut the two frames with dies from that same set, making the card look like it has 4 layers. However, the image and both frames are all inset so it's actually a single layer. 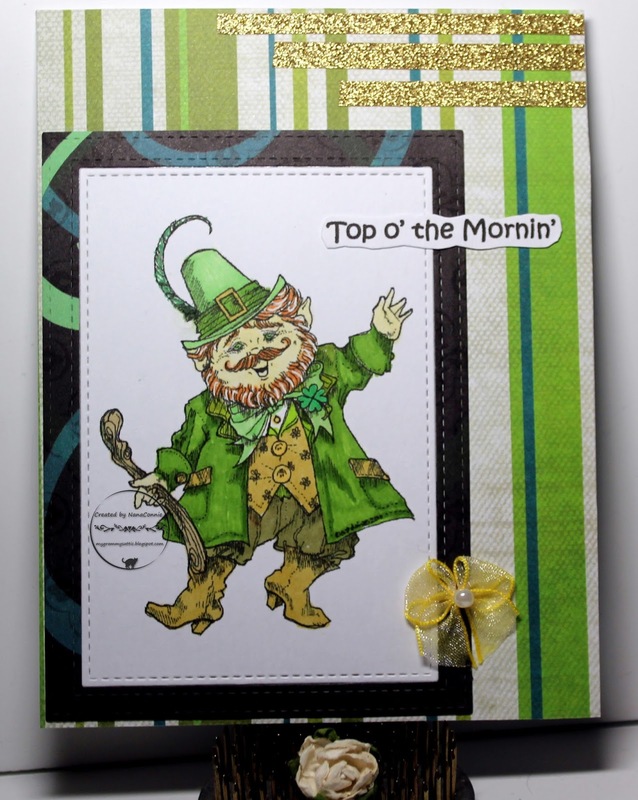 I love doing single layer designs because the cards are easier to mail and require no extra postage but I like the look of complex layers so inlaid die cuts is a fabulous solution. I added only tiny pearls and metal brads for embellishment so it's pretty CAS as well as flat and light weight.